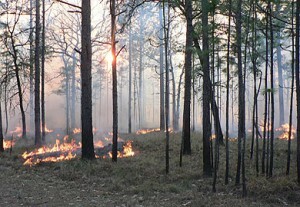 COLUMBIA, S.C. – The benefits of prescribed fire in the Southern “pineywoods” are many and varied—and because of the passion of folks who love and believe in these legal and carefully-planned controlled fires and their results—they are becoming increasingly well-known and appreciated, according to a wildlife biologist and forester with the S.C. Department of Natural Resources. Preserving the ancient and multi-cultural tradition, ritual, and heritage of woods-burning as a landscape management tool—a natural process that has shaped the character of landscapes, as well as people and societies for many millennia. For more information on prescribed burning, visit the South Carolina Prescribed Fire Council athttp://www.clemson.edu/extension/pfc/index.html. The need for thinning longleaf stands and for removing wildings (pines that have volunteered into longleaf stands) is common and usually obvious. Sometimes longleaf was planted thicker than it needed to be, and perhaps mortality of planted longleaf was expected but did not happen, or longleaf or other pines seeded into planted stands from nearby mature trees, or too many seedlings arose in sites being naturally regenerated. On some occasions, landowners’ management values and objectives change, or simply their perspective—what looks like a nice stand of grass-stage longleaf today, may later seem far too dense. For various reasons, many landowners don’t want dense pine stands. Moreover, some government cost-share or other incentive programs aimed at improving early successional wildlife habitat mandate that pines be planted at a wide spacing in order to encourage development of groundcover. This approach promotes good early successional habitat, at least initially, but it may also lead to larger limbs that are retained for a longer period of time, if not for the life of the tree. A stand of open grown longleaf that is not properly burned (all burns that can be conducted on a given site are not equal) will retain low limbs that may produce as much shade and inhibit groundcover as much as the tightly packed trees in a high density planting. Open stands of longleaf pine that have nice cylindrical boles (main stem of tree) with few limbs are a result of either proper prescribed burning practices and/or stands that grew densely at one time but were later thinned.